His name? Well, I figure he looks like David Bowie from his Ziggy Stardust phase. Wild and bright and funky. The Frilled Lizard is world famous for its spectacular orange neck frill, which is displayed when the animal is disturbed or alarmed. At rest the frill acts as a camouflage, allowing the lizard to resemble a branch or bark. They're the reptile emblem of Australia. They hang out in tropical and warm temperate sclerophyll forests and woodland from the Kimberley's across the Northern Territory to northern and eastern Australia and south to Brisbane. Living off cicadas, ants, spiders and small lizards, which are eaten in trees and on the ground. 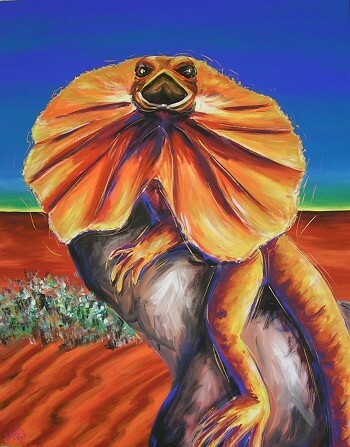 In this case however, I decided to use some artistic license and depict him on the edge of the Simpson Desert because I wanted to use the fabulous contrasting oranges and blues. Prices are in Australian Dollars (currency converter) and include the Australian government Goods and Services Tax (applicable for domestic sales). The prices are ex-Mission Beach and do not include packaging, handling and shipping. If you'd like to buy this painting, or one like it (a commission), or have questions about method of payment, packing and shipping, please email Sal.